I have the three most beautiful daughters in the world. But there is something about being the mother of sons--they can charm their moms into anything. And my boys are the best. Not the easiest or the gentlest or the fastest (maybe the smartest and studliest), but they are THE BEST. 'Rum is turning into a complete boy. He's lost his pacy, he's lost his baby fat and training underpants, and he's currently topping the charts for wild child at our home. He came home with a beat-up eye from Church Sunday--running into a table. Lucky he didn't split it open. This summer, Hyrum rode a horse alone, learned to swim almost completely, and developed a new-found love for all things Harry Potter. He waves a wand constantly, occasionally catching an unaware passerby with the tip of his wand and the back end of his spell. He is adorable, and his chocolate brown eyes trick me out of time out. He says the funniest things right now, and he can't wait for Joy School with his friends. I can't express how much I love this little boy--wild side and all. Tucker, Tucker, Tucker. This shot was taken with my phone while I was in Provo last week. He can be cute. I can't believe the changes in this boy in the few short weeks he's been gone. He's stressing about tests and grades this week (who is this guy???? ), and he's working 20 hours every week at his dream job at the candy counter. I loved spending time with him last week, just him and me, hearing funny stories and laughing and laughing and laughing. They say absence makes the heart grow fonder, but I don't know how I could love him any more than I do, especially when I get a text that says, "Love You, Mom." We've finally discovered a significant difference between him and Hyrum--Rum loves mashed potatoes and gravy. I have a new son to report on: Don't you love this picture? Having Sam as part of our family has been so easy--almost like he's always been here. The kids all fight over sitting by him or who gets to ride on his shoulders. I adore his sense of humor, easy-going attitude, and especially the way he treats my Heidi. I couldn't have hand-picked a better son-in-law, and I'm thrilled to include him as one of my kids. And he pulled a 4.0 this semester! Marriage must agree with him. This may have been as much physical activity as Brad saw most of the summer. His shoulders are bugging, his hip is bugging, his hamstring is bugging. He refuses to admit that he's as old as the calendar states, but he still won't let the boys beat him when they wrestle. Still hot at 43, that's my guy. And Ben? Did you know Ben was still part of our family? We missed him for four entire WEEKS this summer. I couldn't get the computer to read his memory card, so pictures from the National Boy Scout Jamboree will have to wait. Of all the kids, I think the biggest changes have occurred within this teenage body. He's grown another inch or so physically and by leaps and bounds emotionally. He is so responsible, yet still our crazy vocabulary master. I can't wait to see what happens for him this year--football, wrestling, seminary, church dances, school. 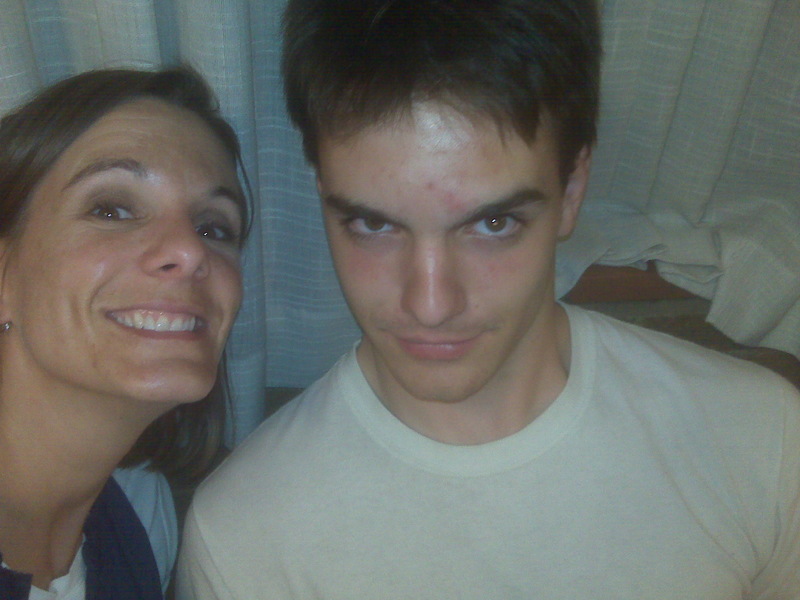 And he still loves his mom more than any other female (except maybe Evie, and I'm willing to share that spot with her). What a guy. He rocks, and not just his abs either. And then there's my Micah--Mikes. That boy is so awesome. When his teacher asked him to fill out a survey, the three words he used to describe himself were "cool, fast, and slow." Definitely not slow on the uptake, that's for sure. This summer he's been all about fun--movies, swimming, camping, friends, Wii, horses, family. And he will be the first to remind me that snack is seven minutes late at 9:52 or 3:22. He is all about rules, especially how they affect others. No broken bones, no mishaps, just occasional spontaneous hugs or a "fill-Mom's-mouth-with-air" kiss. He kept a journal this summer, and I can't wait for him to look back on all the things we did this summer and his perspective. What is it about a mom and her boys? I just feel so spoiled that I get to call these guys my own. Well, I just have one, and he's a dad now, himself. Let me tell you, there's nothing like seeing your boy as a good father. The 'I love you, Mum' has a new resonance. I know exactly what you mean. And isn't it wonderful? makes me wish, not only to be able to have just one more, but to be able to give my husband a son. lucky lady. I will not lie....that Micah just GETS to me. I lurve him. But then again, I sort of love Tucker a lot, oh and also Ben. Shoot, I just can't decide. You do have a great bunch of insane, wild boys, that is for sure! Cute post. I agree Jen, boys are the BEST! I love the way you write! I totally agree. My one girl is like a roller coaster lately..my boys are soooo easy going. and they love their momma...great photos jen...can't wait to see the back to school photos!! What a sweet tribute! As a mom of two boys, I know what you mean. The love I feel for mine is sometimes overwhelming. They still tell me they love me every day and give me hugs (even in public) and it still warms my heart. Seeing my oldest in the roll of dad is amazing. I love being the mom of boys! You have such an awesome family Jen. You are all very blessed. That was a fun little peek into the lives of your guys. Such cute ones too! I know what you mean - I have the BEST time with my boys! I'll drop everything to have a dinner or night out with them. I have to agree. . .there is just something about a mom and her boys. . .something very special. . .great post! I am right there with you...Boys are awesome! I have 3 of my own and my adoring husband who also took the football out at the ward campout this weekend and dominated - ha ha!! Boys just adore their moms - I love it when you can snuggle them when they are young but they give you those big bear hugs when they are older and bigger than you - I find I often think that "these came out of me?". Life is amazing! Your boys are a handsome lot! I enjoyed this so much...I have three sons and you're exactly right--the bond we share is so strong and so different than my 4 daughters and I share...not more than, not less than, just different. My oldest can catch me off-guard and blow milk thru my nose if I'm not paying attention--he's the funniest person I know. And I miss him so much now that he's married and lives in ID. My youngest is going into 5th grade--he is my loverboy...always has a hug and a kiss for me. And my middle son has special needs--he is the softspot in my heart. Oh how I love my boys! Sweet post, Jen. Thank you! I love both this post and the one about your girls. What a big wonderful family!! So much love to go around.